It may not be a jet powered car, but it’s definitely one we’ve seen in sci-fi movies before – the ability to converse with a life-size holographic image of another person in real time. 3d movies are just the start of it and ther’s more to come. The futurists at IBM point to recent advances in 3D cameras and movies, predicting that holography chat (aka 3D telepresence) can’t be all that far behind. Already, the University of Arizona has unveiled a system that can transmit holographic images in near-real-time. Maybe travelling inside the blood vessels of the human body is not so silly after all.We will see…. SENSORS EVERYWHERE TO DETECT INFO FOR INFORMATION TO CENTRAL DATA BASE FOR ANALYSIS-IS THIS THE BEGINNING OR THE END OF IT? The way it is presently, most scientific data must be gathered by scientists, who have to go out in the field and set up sensors or other data recording devices. Within five years, however, a lot of that data could be gathered and transmitted by sensors in our phones, cars, wallets, computers, or just about anything else that is subjected to the real world. Such sensors could be used to create massive data groups used for everything from fighting global warming to tracking invasive species. IBM also sees custom scientific smartphone apps playing a part in “citizen science,” and has already launched an application called Creek Watch, that allows us citizens to update the local water authority on creek conditions. Just as Mapquest is valuable and other online mapping services are to many of us, apparently it’s just the tip of the iceberg. In the not-so-distant future, says IBM, sensors and other data sources (such as the aforementioned citizen scientists, perhaps?) will provide a continuous stream of information on traffic conditions, road construction, public transit schedules, and other factors that could affect your commute. When you inquire about the quickest way of getting from A to B, computer systems will do more than simply consulting a map – they will also take into account all the variables unique to that day and time, combine them with mathematical models and predictive analytics technologies, and advise a route accordingly. It is also possible that, utilizing such data, traffic management systems could learn traffic patterns, and self-adjust themselves to minimize congestion. IBM has announced its fifth annual Next Five in Five – a valued list of five technologies that the company believes “have the potential to change the way people work, live and play over the ensueing five years.” While there is an absense of flying cars or robot servants on the list, there are however holographic friends, air-powered batteries, personal environmental sensors, customized commutes and building-heating computers. Get a firsthand look at COMSOL Multiphysics Version 4.1. This latest release of the industry-leading multiphysics simulation environment features several enhancements that directly result in productivity gains for end users. The innovative Model Builder is upgraded to include even more graphical programming functionality, including instant replication of nodes in Model Tree. Advanced users will benefit from the equation view for all physics interfaces. Meshing includes an improved algorithm to take into account the model’s physics, called physics-induced meshing. And visualization now supports labeled contours and polar plots. See all these features and more by attending this webinar. 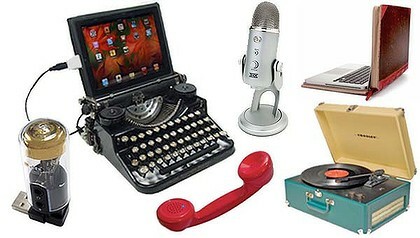 Clockwise from top left, the U.S.B typewriter, the Yeti THX-certified microphone, the BookBook MacBook Pro case, the Crosley portable U.S.B. turntable, the ThinkGeek Bluetooth handset and the Surround-sound X-Tube. This has been a great year for the next new electronic thing. The iPad, new iPhone, the Nexus S, HTC Evo and other Android phones, the Kindle 3 and Microsoft’s Kinect caught the eye of consumers. There are theories: The throwback designs make challenging technology seem familiar. For the technically proficient, an old phone handset that connects to a cell phone seems comically ironic. Retro designs can also give a sense of permanence to disposable devices. Some of it is art. An example of the phenomena is a manual typewriter refashioned as a computer keyboard. Jack Zylkin of Philadelphia made one as a novel way for people to sign in when visiting Hive76, a Philadelphia communal studio for electronics tinkerers. “I thought it would be kind of a lark,” he said. “I didn’t realise there was such demand for them.” Now he is turning out several typewriters a week, with a two- to three-week lead time for new orders. Zylkin says he starts with a typewriter that has been refurbished by a retired Remington salesman, then wires it with a sensor board that recognizes when a key is pressed. It leads to a USB plug that makes the typewriter work like any computer keyboard. Even if the type bar doesn’t hit the platen, a computer will recognize the input, but if you bang the keys hard enough you can make an old-school hard copy on paper while a computer also records your keystrokes. The typewriters sell for $US600 to $US900 at the website Etsy, although it is $US400 if you supply your own typewriter. If you are handy with a soldering iron, you can buy Zylkin’s do-it-yourself conversion kit for $US70. A variation of this theme of fashioning the old into new relies on the smart design of the old Western Electric Bell telephones. Consider the handset. Unlike today’s telephone earpieces and cabled headphone and mic arrangements, the large handset put the speaker over the ear and the microphone next to the mouth so bystanders weren’t forced to listen to bellowed phone conversations. The gadget purveyors ThinkGeek have taken that old handset and added Bluetooth so you can have some privacy while connected wirelessly to a mobile phone. The $US25 handset can transmit and receive at a distance of about 30 feet from your phone. Crosley Radio has been making the old new again since the early 1980s when a group of investors bought a discarded radio brand and started cranking out replica radios. The company has replica Wurlitzer-style jukeboxes that play music from CDs or iPods. “What really rolls out the door is the turntables, that has been a runaway train,” said James P. LeMastus, president of Crosley. The company has had a hit with the Crosley AV Room Portable USB turntable, made exclusively for the youth-oriented clothing chain Urban Outfitters. The $US160 portable player has built-in speakers and an amp, and a USB connection so it can be used with a computer to turn songs on vinyl records into MP3s. The company makes about 25 styles of turntables, some with iPod docks and CD and cassette tape players and recorders. They can be found at stores including Restoration Hardware, Pottery Barn and online. The Yeti from Blue Microphones may look like something from the golden age of radio, but it is the first THX-certified microphone, meaning it is capable of high-fidelity reproduction. While it looks as if it belongs on the desk of Walter Winchell, it has three built-in miniature mics that can capture sound three ways: from just in front of the mic, in stereo or from an entire room. The Yeti works on PCs and Macs and requires no software drivers to work, although there is a free recording program for it in the iTunes store. Good enough to record your band’s demo, the $150 mic is also popular with podcasters and VoiP users who want to sound as smooth as Orson Wells. The X-Tube looks like a vacuum tube from inside an old radio that would have broadcast Wells. It’s really a small processor that plugs into a computer through a USB connection to produce surround sound for headphones. The warm glow? A blue LED light. The device processes DTS Surround Sensation software to alter the volume of certain frequencies and add delays to some sounds, all psychoacoustic tricks to fool the brain into perceiving sound as coming not just from left and right, but from the front and back as well. The device, which comes with over-the-ear headphones, isn’t easy to find in the United States, but can be ordered from Japan for about $US95. Sometimes, retro designers cloak the electronics in something other than older electronics. Makers of laptop covers usually brag about the high-tech materials they use: high-impact plastics, advanced neoprenes or carbon fiber. Twelve South brags that its MacBook Pro and iPad cases use old-fashioned bookbinding technology. The covers are leather-bound and distressed to look like a collectible volume. The cases have a hard cover on top and bottom, with a zipper around the center to keep your computer secure. The BookBook covers are priced at $US80 to $US100, depending on the size of your computer. The company says the covers disguise the device inside and could deter thieves — unless they know that many collectible books are worth far more than the next new thing. Dec 7 – Robotic hummingbird wings may hold secrets to a new family of aircraft, capable of hovering steadily even in high winds. Scientists from New Mexico State University say experiments reveal promising results. Dec 7 – It is only one atom thick, but according to the Nobel prize winning scientists who discovered it, flourographene could soon be making a big impact. Stuart McDill reports.